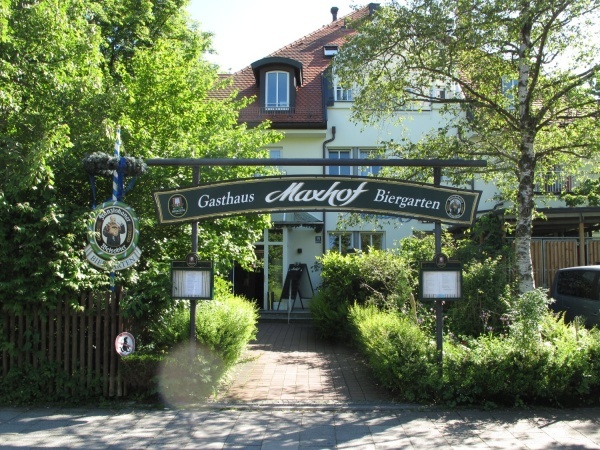 Maxhof restaurant and beer garden is located in the former working class district of Maxhof near the Forstenrieder Park. In 1804 the building was part of the Gut Maxhof farmland estate with gardens and parks, still surrounded by woods and fields. In 1923 the Maxhof estate was converted into a restaurant with a banquet hall. Over the years to follow, the Maxhof became a favoured meeting place for clubs and events of all kinds. In 1955 the Spaten Brewery bought the estate. In 1991 the restaurant and adjoining buildings were demolished and rebuilt into its existing style. The small beer garden has 250 seats on old-style fixed-to-the-ground tables in the self service area which are partly shaded by large trees. Throughout the week the food and beer stall opens in the afternoon. Before then, guests can either buy their beer from the waitress in the serviced area or fetch it themselves from inside the restaurant building. The beer served is Spaten and costs €6.80 p/Maß (April 2013). The food stall offers Bavarian meals such as spareribs and Hendl (grilled chicken). The beer garden and restaurant is open daily from 11am until midnight. This page was last modified on 18 May 2018, at 19:32.